Tags wasn’t an enormous part of Apple’s WWDC keynote, but the more I think about it, the more implications that it has for the future of the file system on OS X. In fact, it’s something I’ve been thinking about since a panel I was on at Macworld expo earlier this year. The topic was iCloud, App Stores & Other Things to Fear: Has Apple Forgotten Power Users? And the other panelists, all far smarter than me, included Rene Richie, John Gruber and Paul Kafasis. One of the questions that came up was how Apple would handle expanding iCloud’s capabilities to cater to those of us who grew up with a traditional hierarchical structure with files inside of folders ad nauseum. My opinion then, and now, is that Apple was trying to break down and evolve the file system in a way that removed the hierarchy from sight, if not from practice. I didn’t really know how it was going to go about that, as the simple siloed bucket of Mountain Lion clearly wasn’t it, as I mentioned in my review. But earlier this month after the keynote, I was sitting and chatting with some developers and designers about tags and the way that the traditional file system would evolve, and the ideas coalesced. The core of it is this: the OS X finder is a truck, and iCloud with tagging is the file system as a car. I’m stretching and massaging the Steve Jobs metaphor applied to the iPad (as a car) and ‘traditional’ PC’s (playing the role of trucks) here. But I think it’s a valid way to look at the roles of the standard old file system that is represented by the good old finder and its contents, and the theoretically seamlessly syncing iCloud. At the time, Spotlight was the solution, and I think that search still plays a big role here, but more on that in a minute. If Apple is going to make iCloud really useful, it needs to take on a role somewhere in between the tricycle it is now and the full on ‘heavy lifting’ truck of the current Finder. The Finder is clearly too complex and unwieldy for a new world where mobile devices are your primary computers, and your laptop or desktop are specialty tools. AKA, the world we live in now. 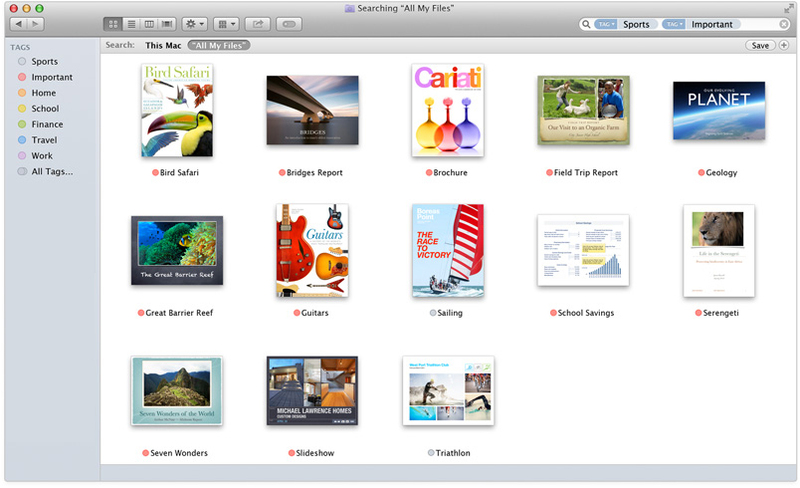 The emphasis of tags in Mavericks, along with the inclusion of tagging in iCloud, makes for a clear stepping stone between those two paradigms. If you extend this procedure out a few years, it seems clear that the end result is a ‘Finder’ that is optional, rather than mandatory. Instead, the iCloud bucket managed by non-hierarchical tags for file types, sizes, contents and more, will be the primary file system for OS X users. No, the file system and Finder aren’t going anywhere, but they’ll be used when you need to do ‘heavy lifting’. Developers, photographers, video editors, database managers and others who need the standard folders will have them if they need them. But that won’t be the file system for the 80%. 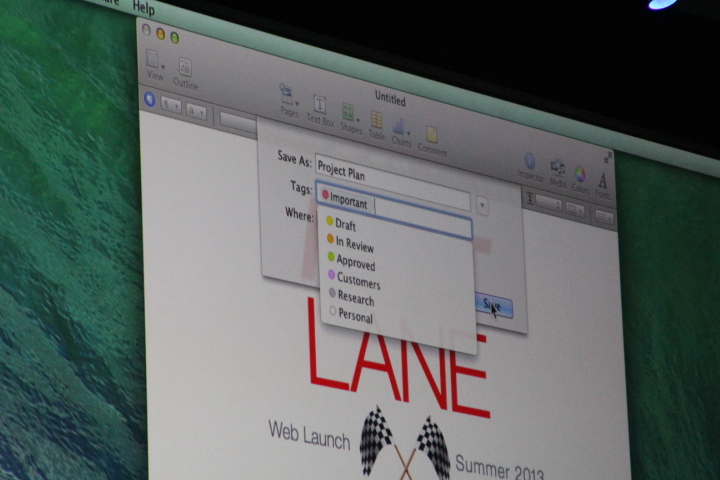 In Mavericks, tags are available both locally on your Mac and in iCloud. they can be managed, searched and sorted in both areas. And they have several distinct benefits that fit in with this new mobile world. First, they’re both dependent on and native to search. Universal search is the new basis for human interface. Whether that’s by voice or type, we will be searching for things far more than we will be navigating to them. This is especially true as our own personal data stores get larger and more unwieldy. Even if our data is in the cloud, we’re all just human Katamari, gathering files and photos and data as we roll through life. Also, Tags are not exclusionary. They eliminate the odd problem that has always existed when a file really belongs in more than one place or category at a time. Is it both a personal photo and a work file at the same time? No problem with tags. Duplication was the traditional way to handle this before. To give you an idea of what a standard Finder window might look like at some point, I’ve modified the following screenshot to remove what we can consider the ‘advanced’ section at the top and replaced it with the ‘tags’ section. Note, too that this section is already labeled Favorites, so it’s not a mandatory thing. Does that sight scare you? Like I said, don’t fear, you’ll be able to get it back for quite a while (I’d assume). But for a lot of people tags which are assigned automatically based on attributes like media type, dates and folders that they already exist in (great for transferring old folders and files when switching) are a much easier way to quickly find things they want. If you think I’m nuts, fine, all good. But remember that I’m coming at this with the mindset that the next generation of Apple users will likely see, use and master an iPhone or iPad before they ever even touch a Mac in earnest. A file system that feels native and works well to sift through laterally organized files —rather than traditional hierarchical structures — will feel far more right for them than an arbitrary filing cabinet metaphor. “I mean, what the heck is a filing cabinet anyway,” I’m sure my kid will ask me when she can talk.